Roling as in role playing. I know. ‘Roling’ is not a word. But it works for a cool title. The post is talking about role playing games, rpg’s from now on. I like role playing games. 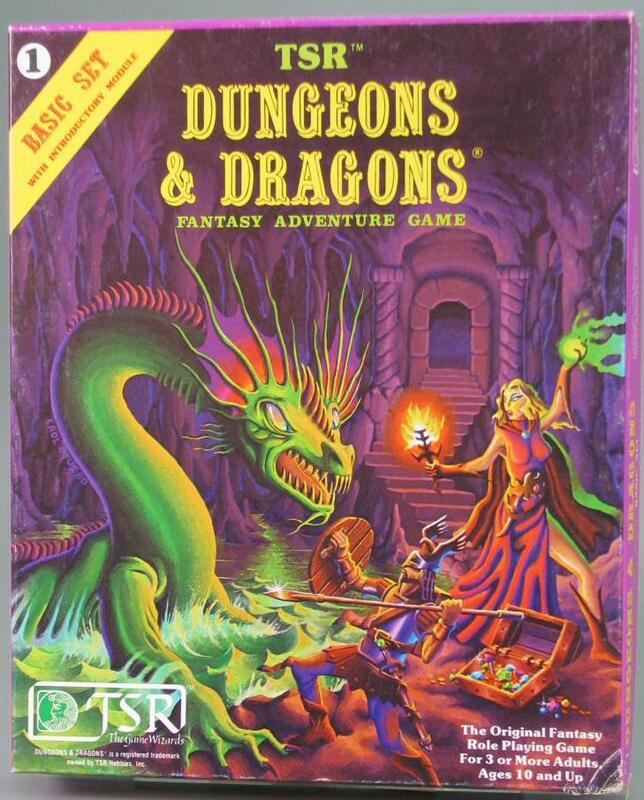 I’ve dabbled with them for many years starting back in the early ’80’s with the Purple Box Dungeons & Dragons. I still have it. It’s battered and well used. And I’ve started using it again. I’ve introduced my 12 year old son to it last week. We rolled up some characters and I started him out with B1 – In Search of The Unknown, the first official D&D module. My plan is to run him through the whole series of modules from that time period. I own many of them from way back. Most can be purchased inexpensively from DriveThruRPG.com. The return to D&D started me thinking about my rpg life. As I said I started with that red book. I didn’t have anyone to play the game with at the time I bought it. But the idea of creating my own fantasy world and stories. And people playing characters in that world / story was really cool. So I bought that Purple Box and got started. I found out that my cousin Michael had similar interests so I had a player. I built dungeons and more dungeons. I bought modules. I bought Dungeon magazine. I GM’ed for him. It was fun. D&D was pretty much it for us. Michael did buy Car Wars and we played that some. It was cool. It still is. I need to get the most recent version. But D&D was the one. Mostly because we didn’t know there were more out there. Our local ‘game’ store was a hobby shop that had a very small game section consisting mostly of wargaming supplies. Flash forward to college. My D&D playing had pretty much stopped but I continued to build my world. And link my dungeons into a campaign. But I was itching to do some playing. I discovered a local gaming group and joined them a couple of times as a player. It was ok and fun. But the biggest thing I got out of it was the discovery of other rpgs. There was Rolemaster, some sci-fi games that I don’t remember well, and Toon. 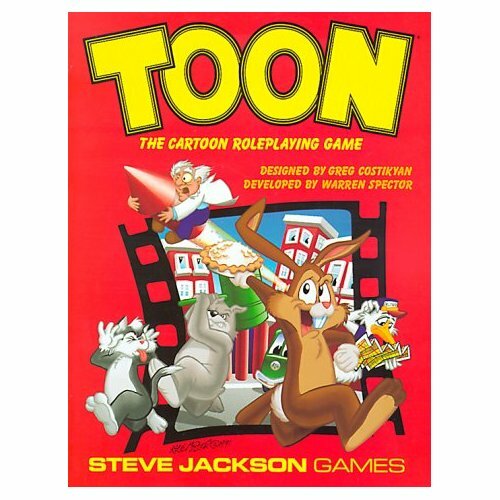 Toon was a revelation to me. Here was an rpg that was not fantasy. It was different and hit my love of cartoons. I enjoyed it a lot. After college I stopped playing for a long time. But I kept building my world and campaign. It was a creative outlet for me. Then I found out some friends on mine from church played rpgs! Sweet! We got together and started a regular game session. I was the GM and we started the campaign I had been working on for so long. We used a Rolemaster heavy system (that’s what they were used to). It was super awesome. As we all grew and kids came along, our sessions dwindled and disappeared. We still kept in touch and had an occasional game but nothing regular. At some point during this time I somehow discovered the indie rpg community. This was the next revelation in rpgs for me. Here was a whole new world with some exceptionally cool games and ideas. I dove in and found out that I was living in a hot bed of indie rpg activity. This was centered around Jason Morningstar and Andy Kitowski. Jason is the designer of several award winning indie rpgs – The Shab Al-Hiri Roach, Grey Ranks, and most notably Fiasco. Andy is the founder of Story Games, THE indie rpg forum / online community after The Forge. I met Andy and he introduced me to Jason and their group. They and all that community are very welcoming to new gamers. I was able to find new games like Psi-Run, a fantastic game where you play amnesiac superheroes being pursued by a mysterious agency. 3:16 – Carnage Among The Stars in which you play space marines. Dogs In The Vineyard that takes place in the late 1800’s and you are a religious sect’s lawman. There were so many and all so different. Different in theme. Different in style. Different in mechanics. So many. So cool. This was an awesome community to be involved in. And inspiring. I starting thinking about designing games of my own. This community is very supportive and helpful to fledgling designers. Story Games was a place where you can ask questions and post new idea and get good feedback. I started interacting with some other designers and doing some playtesting. Jason in particular was / is extremely helpful and supportive. 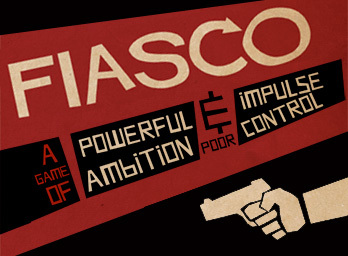 I was able to playtest Fiasco throughout its development as well as a couple of his other designs. That was a lot of fun. During this time I discovered board games. And my role playing was overtaken by board gaming. I found the board gaming community equally as welcoming and fun. I have found that it is equally wonderfully varied. I’ve found that I can be a game designer here also with the same amount of support. I love it and am here to stay. This article started out to be just a listing of some of my favorite role playing games. I’ll post that in a follow up post because there are some super awesome games. But it turned into my gaming history. That’s fine. It was fun to write and I hope at least somewhat interesting to read. Perhaps you had a similar journey. Or one that was very different. I’d like to hear about it. Post something below.